So I thought I would begin with something I really like and have bought a few times (this doesn’t often happen, I like trying new stuff). When I have tried face scrubs before they usually have large chunks of something (which scratch) or tiny beads (which don’t do anything much. 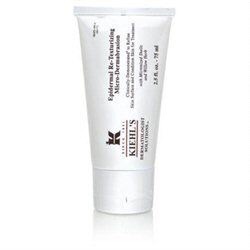 The Kiehls Epidermal Re-texturising Microdermabrasion has very fine particles and it really feels like it’s taking off the dead skin. My face really does feel very fresh and smooth after using it. I would normally clean my face first (if I have time) then massage it into all the nooks and crannies of my face and over my cheeks, forehead and chin. I spend about a minute or so doing it then rinse off and dry. Then apply a serum and moisturiser. I use the scrub maybe once a week when I want to look fresh, it leaves your skin smooth and ready for makeup. I have nothing bad to say about this stuff. I think I paid about 40 quid for it in John Lewis but it lasts for many many months.